Today I’m attending an academic conference about writing, so I decided on a professional but fun dress by Anna Scholz for Simply Be. Love that dress on you! The pattern and colors look fantastic! This dress is fabulous! I love the little pops of yellow in there. Love the dress and it’s a lovely fit!!! Beautiful outfit. The geometrical print is making this outfit different. Looking like a cute doll. You look lovely 🙂 I’ve been reading through lots of your blog and I wish you all the best! Wow! 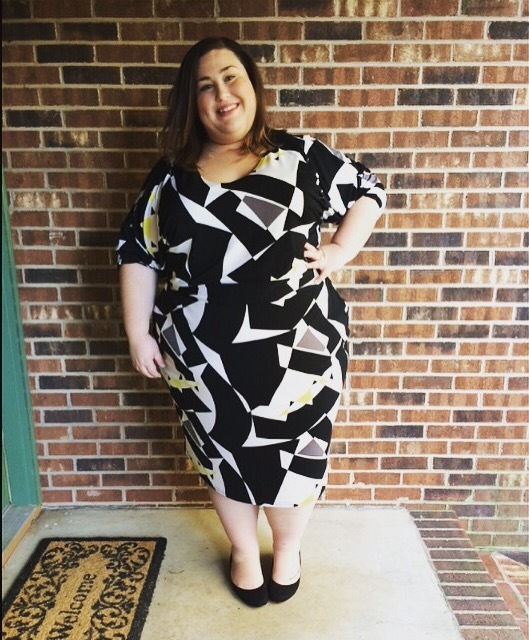 This dress is really flattering on you…beautiful. Isn’t it nice when we find something that not only fits but also looks amazing.